With some inspiration from the potential snow storm last week, I endeavored to test my emergency preparedness for heating my apartment when the power is out. In Vermont, the most reliable heat source for the winter is arguably a wood stove, mainly because it functions independently of electricity and will continue to operate the same whether the lights are on or not. My Rinnai heater is not as simple, but it does require very little energy and is entirely contained in one unit with one power cord. Additionally, its fuel source is natural gas and will continue to run independent of electricity. So the only thing I had to do is provide it the 120 VAC power source and see what happens. 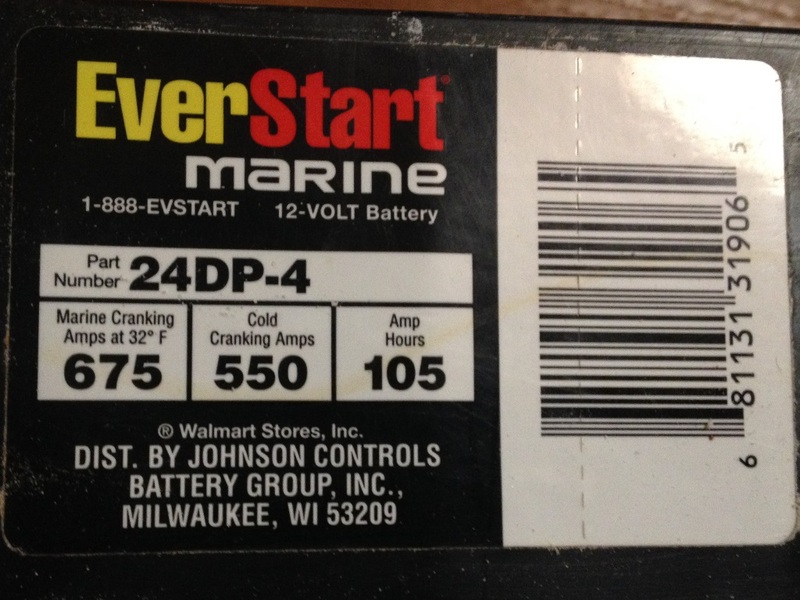 I have kicking around an old Marine Cell battery from a Camper I used to own, and an 800W inverter that I picked up when preparing for Tropical Storm Irene. The inverter is a little small and only provides modified sine-wave power, but there is only one way to find out if it works! 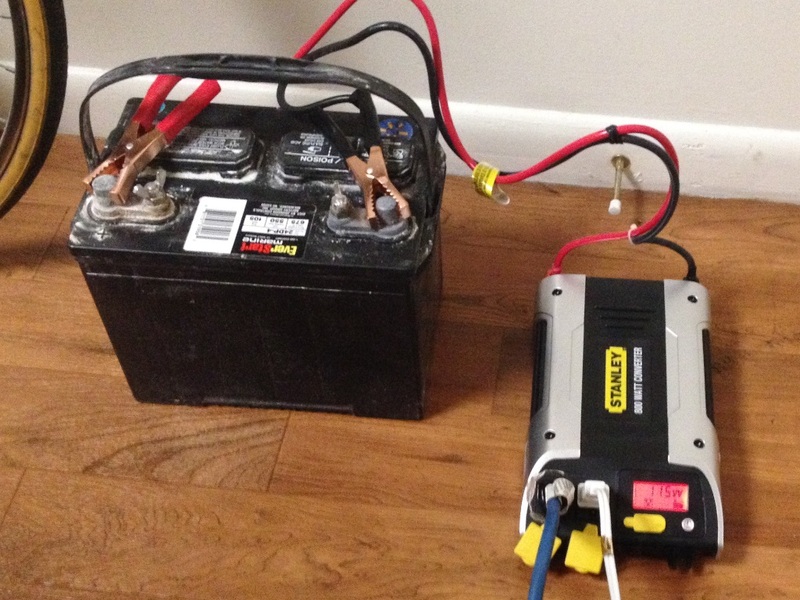 I attached the inverter to the battery and it powered up. 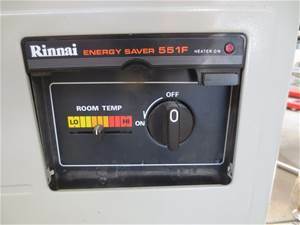 I powered down the Rinnai, then unplugged the power cord to the Rinnai from the wall and plugged it into an extension cord and into the inverter. Immediately the Rinnai started to buzz and hum. I knew this was due to the power supply in the Rinnai not being optimised for the modified sine-wave power, but the inverter wasn’t showing excessive power being drawn and nothing bad seemed to be happening, so I proceeded. When I turned the Rinnai back on, the buzzing picked up and the inverter started displaying power use. I then turned up the temperature control to ask the Rinnai to make heat, and it did! I had heat! Test successful! 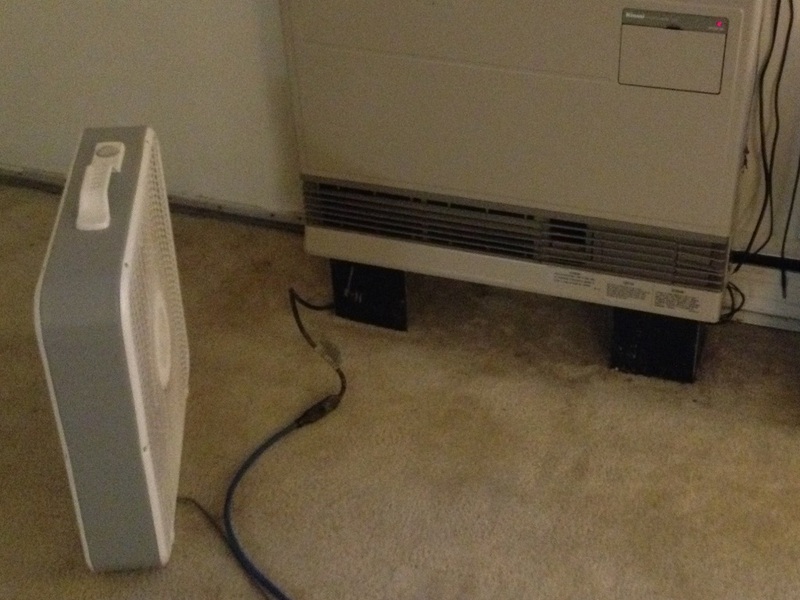 I also added the box-fan we use to push the heat upstairs, and it buzzed but ran just fine. With the fan and the heater both running on LOW the draw was 115W. Some quick and super dirty math approximations tell me that the battery (if fully charged) will run this about 11 hours. This would be longer if the box-fan isn’t running (less power would be used). 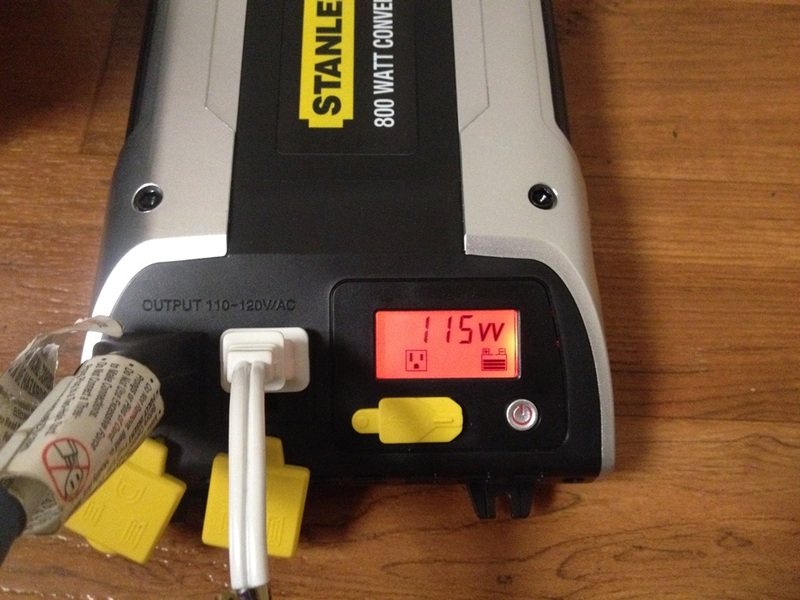 Of course, the inverter can be run from any 12V source. My Honda Civic has an alternator with a faceplate rating of 70Amps.